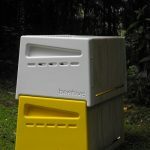 This video is a close up review of NUPLAS food grade 8 frame bee hive with http://www.mahakobees.com/blog. This beehive is made completely out of food grade plastic, and we take a close look at how this plastic 8 frame full depth beehive is constructed, with all its component – plastic ventilated bottom board, plastic top cover or roof with ventilation holes, plastic hive entrance gate, plastic hive handles, and the four part flat packed plastic hive body brood chamber or a full depth plastic honey super box. The beekeeping community is divided on the use of plastic hives. Some are against the use of plastic frames and plastic foundation. Others are in favor. We would prefer to use wooden beehives ourselves as it is much closer to the bees natural habitat. Better still, log hives or top bar beehives would surely be the kindest option for our Apis Mellifera friends. This may in deed be acceptable for small backyard beekeepers, or a hobbyist beekeeper that has a handful of beehives, and doesn’t need efficiency in bee maintenance and honey production processes. Langstroth beehives, where a specific bee space is maintained between the honey frames, provides this efficiency, and yes, the debate is very heated about the commercialization of the beekeeping industry as a whole and how bad this is for the most important pollinators in our food chain. We lean towards this thinking ourselves and do our best not to harm our honey bees and always want only the best for these amazing creatures. However, limitations on beekeepers time and resources needs to be maintained in a balance with the well being of the honey bees. So let’s look at this plastic beehive and try to overlook the negative stigma automatically attached to plastics associated with most food industries, and see this beehive for what it is and how it may help beekeepers become better custodians of their bees, if at all. We would like to stress, that we are not selling this product, nor do we receive any payments from NUPLAS for this review. 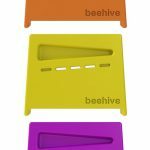 We simply found this product, purchased a single unit of this sample plastic beehive, and wanted to share our experiences with fellow beekeepers by producing a short review YouTube video of this plastic beehive.Whether it is a good option or not, whether you are in favor of plastic beekeeping equipment and beekeeping supplies or against, fan or not. This is simply information for your consideration so you can create your own opinion. 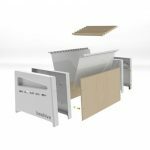 Durable, no painting required, very easy and fast to assemble, stores flat packed, super easy to clean, easy to heat treat, no rotting, no insect or other rodents can burrow or bite through, no warping, consistent hive design and size, compatible with traditional beekeeping equipment, long lifespan, integrated entrance and beehive entrance gate, UV resistant, good insulating properties, all in one bottom board, ventilated top cover, ventilated bottom board where small hive beetles (SHB) will fall through, no paint and undercoat specks contaminating your honey and hives as you use the hive tool. We will post more as we trial the hive throughout this season. 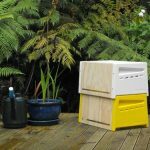 We hope you enjoy this video review of the NUPLAS plastic beehive and invite you to share, like and subscribe to help us grow this beekeeping channel further. Your comments are much appreciated.